There are certain furniture pieces that really resonate with me. When I saw the Tribeca chair by Jean De Merry (represented by the R. Hughes Showroom in Atlanta) on the Ragland Hill Social blog, I was smitten. It is sculptural and sophisticated, and the low slung style makes it very versatile. With the busyness of the past year, I had somewhat forgotten about this chair until Ryan Hughes posted this link on Facebook - a feature in Apartment Therapy on Jean De Merry's ten years in furniture design. (Click here to see article). Ten tastemakers were invited to put their own spin on a piece from Jean De Merry's line, and artist Joel Morrison selected my favorite chair as his source for inspiration. 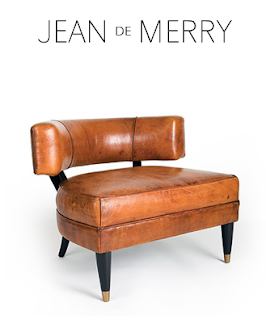 When looking through the Jean De Merry website, I noticed that the Tribeca chair comes in three different looks - no tufting, medium tufting, and deep tufting. Which look do you prefer? The amount of tufting - I think it depends on what is going on in the room where it will be placed. If a room needs more texture, then the tufting would be good. Are you getting this chair for your new house? Totally agree - what a fabulous piece!! It's so hard to pick a favorite - they are all chic for different applications!! Wow! This chair would make a great statement in any room! The 2nd one is so "rock & roll". Maybe too much for me, but so fun and got a smile from me. Loving seeing this. Thanks for sharing it, Holly. I think the proper look for this chair is without tufting! If you start tufting a modern piece like this, can tassles be far behind? Great chair....would love to see it in a great print too. I think I prefer the untufted version though I am a huge fan of tufting,I think the clean, sculpted lines of the chair lend it itself to not tufting and to allow the elegant shape of the chair to take center stage. Hope alls well! Stop by...doing a great giveaway for a goregous Kilim bench! I've never seen one of these in person. When I do, I'm going to give it a try. Love the sophistication of the untufted version. Sleek and elegant! Would look great as a contrast for light upholstered pieces. The elegance of the untufted with the clean lines really appeals to me!! I also prefer the untufted, but I'd be interested to see this piece in a totally different finish. Just spent a while scrolling back down your posts, especially love the painted floors. I definitely prefer the chair without tufting. It is simple and beautiful. Typically, I love tufting. But in this case, I prefer that chair without. It looks cleaner and fresher. Love this chair --- sculptural, yet looks so comfortable! Definitely agree with a poster above - no tufting. The lines of the chair are so interesting, why disturb the beautiful with more bells and whistles? Restraint is one of the most difficult elements to achieve in design. I don't have to say that to you Holly because your taste shows that. Hope you are buying this chair. Hi Holly, this modern chair looks so much better without the tufting. It's beautiful! It's such a wonderful style...would love one in an aged leather!! I also prefer this chair with no tufting. Love the leather, too! It is one sharp chair. Its a beautiful chair, particularly without the tufting, but I must say doesn't look particularly comfortable to sit in. Perhaps ok to perch on for brief moments, but without back support above the lumbar region maybe its more appropriately called a stool? Has anyone sat in/on one for more that 10 minutes and can comment? These are awesome... my preference is no tufting or medium tufting! The deep tufting is a little too much for me, but then again it would depend on where and how the chair would be featured!